Maximizing fun from playing mahjongg. MaxJongg Game rules is bent a bit to make it more challenging by adding a third dimension. Besides being the only truly 3D mahjongg computer game, MaxJongg Game offers 52(!) layouts together with a layout editor, 5 tile sets, 15 background pictures and 9 original sound tracks, impressive graphics and funny tile sets. The sound effects are spectacular; the game comes with true 3D sound! ...... The sound effects are spectacular; the game comes with true 3D sound! MaxJongg Game is a great solitaire game. First, MaxJongg is really simple and easy to learn. 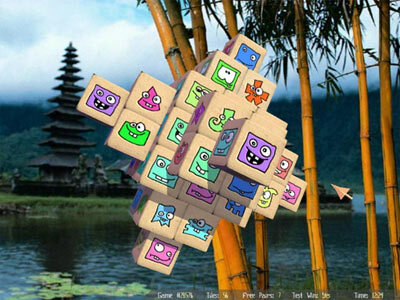 The player is to remove free tiles by pairs. There is some strategy involved, however - make the wrong move and you will have no more moves to make. In general, however, MaxJongg is rather a simple game that delivers long hours of fun and excitement. Qweas is providing links to MaxJongg 1.3 as a courtesy, and makes no representations regarding MaxJongg or any other applications or any information related thereto. Any questions, complaints or claims regarding this application MaxJongg 1.3 must be directed to the appropriate software vendor. You may click the publisher link of MaxJongg on the top of this page to get more details about the vendor.